Location: St. Louis Avenue and Garrison, North St. Louis. 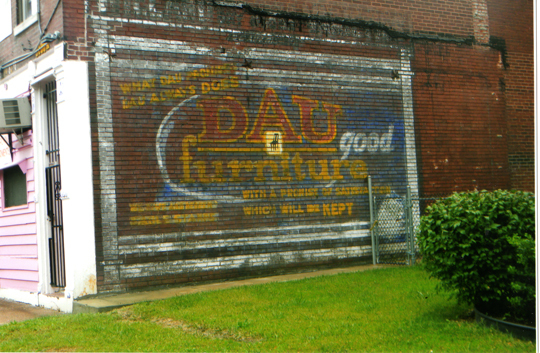 As so often happens, this wall sign for Dau Furniture was suddenly exposed a couple years ago, circa 2009, after an adjoining building was razed. 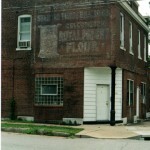 The west-facing sign on the side of what is now a hair salon is quite lengthy in copy and likely dates to the 1950s. 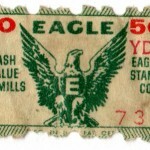 The first four lines reads: “What Dau Promises / Dau Always Does / With A Promise of Satisfaction / Which Will Always Be Kept.” This is followed by a proclamation sure to please any thrift-conscious housewife of the period, namely that “We Give And Redeem / Eagle Stamps.” Note the tiny chair highlighted in the middle of the ad, a rather curious image to showcase their product line—almost as if they are saying “Doll Furniture.” Nevertheless, Dau Furniture still operates today, with stores in Grover, Ballwin and Wildwood, Missouri. 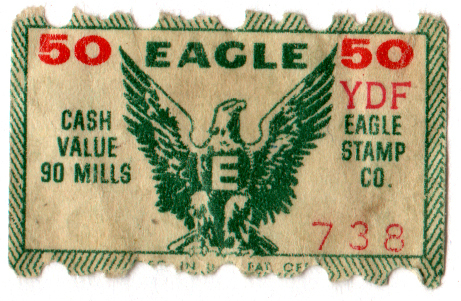 This is not the case for Eagle Stamps, which got their start in May Company department stores at the end of the 19th century. The trading stamps were given out with purchases and pasted into booklets which could be redeemed for merchandise. The Famous-Barr chain in St. Louis issued them for decades until the early 1980s, when they were canceled. 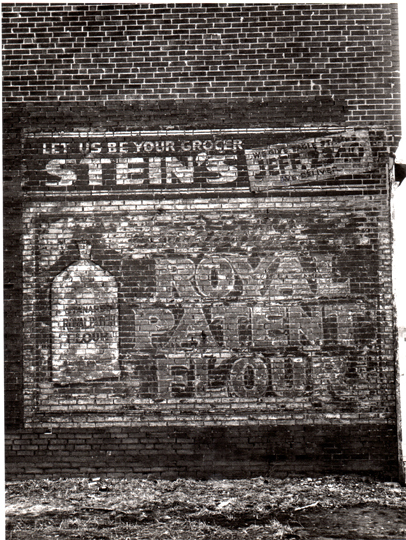 No wonder there are so many extant wall signs for Royal Patent Flour in the Mound City—the flour was the flagship product of the Stanard-Tilton Milling Company and the Stanards were Captains of Industry in St. Louis during the 19th and 20th centuries. William K. Stanard—son of Edwin O. Stanard, former governor of Missouri—was president of the company, while his son, Edwin T. Stanard, a 1906 Princeton graduate, was, at various times, vice-president, general manager and secretary of the mammoth business concern. With principal offices in St. Louis, Stanard-Tilton owned mills, warehouses, and elevators in Dallas, St. Louis and, in Illinois—Rockford, Jerseyville, and Alton. The company was eventually bought out by Pillsbury Flour Mills, which maintained a plant in North St. Louis until it, in turn, was bought out by Archer-Daniels Midland [ADM], which still operates the milling facility located at I-70 and Shreve Avenue. 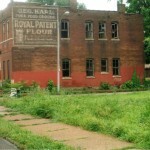 The Painted Ad has located five different Royal Patent Flour walls in the St. Louis city limits, and there are likely a few more out there undiscovered. 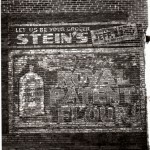 One particularly faded specimen located at Virginia and Idaho, in far South St. Louis, asks “Why Experiment With Other Brands?” In 2007, veteran walldog Lonnie Tettaon was commissioned by the Dogtown Historical Society to “redo” a seriously faded Royal Patent Flour ad on the west wall of the former Central Cash Grocery & Market on the corner of Central and Wise. 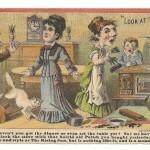 Like other such ads, this one bore the image of a flour sack with plenty of [now] antiquated ad copy. 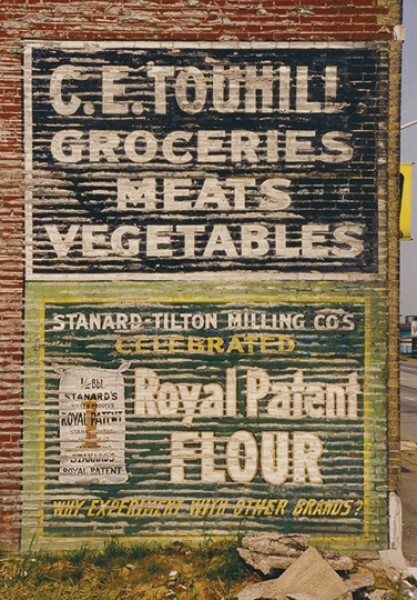 Tettaton repainted the sign in green and yellow colors common to the original layout of Cash Markets, which were a small chain of stores. 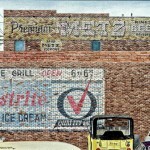 The restored sign is now a minor landmark in Dogtown. Old Pattison Whisky has seen the light of day after 111 years. 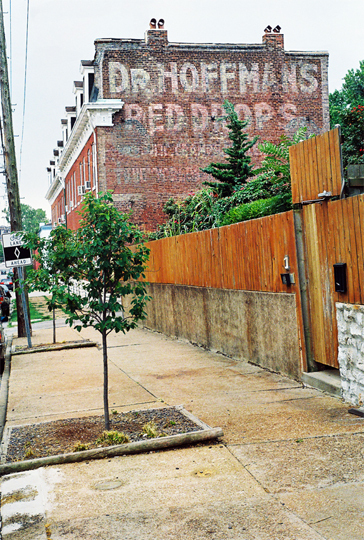 In yet another example of a beautiful old sign suddenly revealed, this west-facing brick wall on Folsom Avenue in near-South St. Louis was exposed in June, 2011, when the adjoining building collapsed. Don Bonnell, who owns both buildings plus a third connected structure that holds a machine company, explains that the sign had to be painted prior to 1900 because the building bearing the sign was built in 1895 while the adjoining tumble-down building dates to 1899. This four-year window coincides with the short-lived commercial history of Pattison’s Limited of Edinburgh, Scotland, a distillery which incorporated in 1896 and went bankrupt in 1898. 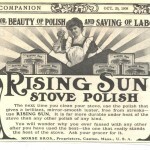 The company spent a veritable fortune on advertising—60,000 pounds in1898 or what would today be 4.3 million pounds in the United Kingdom alone—and, indeed, that was a factor in their demise. Yet, a century later, here, across the Big Pond, in a Midwestern city, their legacy lives on. 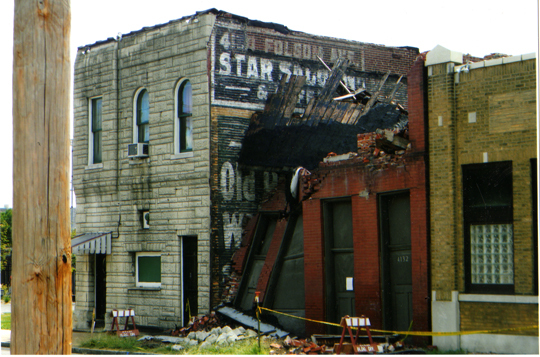 For several months after the building collapsed, the damage had yet to be attended to, meaning that the building was still in a state of collapse—the facade folding in upon itself; the roof jutting earthward, giving in to gravity; the once-stalwart storefront now a gaping mouth vomiting bricks and mortar. Broad, yellow crime scene tape surrounded the condemned building, fastened to anything upright, hoping against hope to contain the rubble. This urban eyesore was not the fault of Bonnell, who had paid a contractor to tear down the derelict structure and haul away the debris. The contractor was busy on another job and promised he would get to it when he can. He finally got to it … the following year. During this interim period between partial exposure and complete unveiling of the old wall, what little there was to be seen of the original sign proved quite tantalizing. At far left, large letters start to spell out “Old Pa—” The line of copy below starts with the letter “W.” Letters are white on a field of dark green. 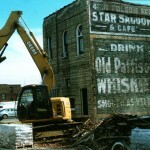 With so little of the sign actually visible, how do we know it is an ad for Old Pattison Whisky? 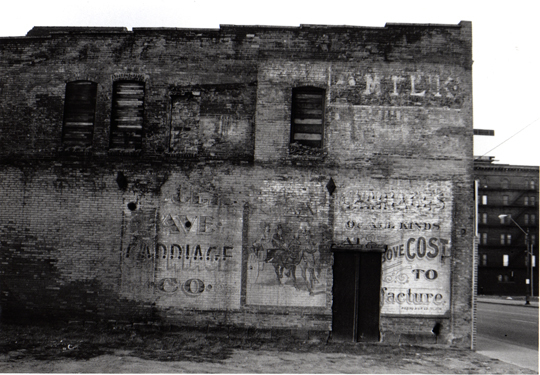 Because the other side, the east-facing wall, of this very building once bore the exact same sign. Bonnell says he admired that one, too; then he painted his own sign over it. What is entirely legible at the top of this building, above the currently obscured whiskey sign, is the name of the business which once flourished here: Star Saloon & Cafe. 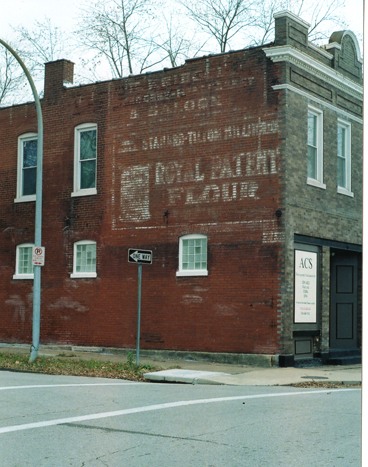 It makes sense to paint a whiskey ad on the side of a saloon, especially when that saloon was across the street from the old Liggett & Myers Tobacco Company, one of several plants belonging to one the oldest and most successful tobacco companies in America. The factory, a sprawling complex occupying several blocks, shuttered after a major fire in the late 1970s. 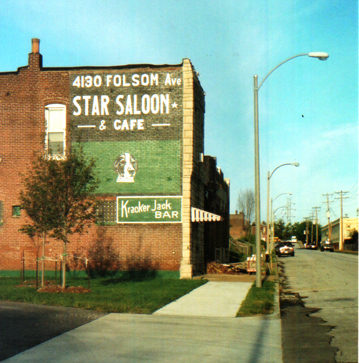 But while it operated, it’s a safe bet that the Star Saloon & Cafe was a busy place throughout the day and night, likely populated by hungry, thirsty factory workers coming off or going on their shifts. 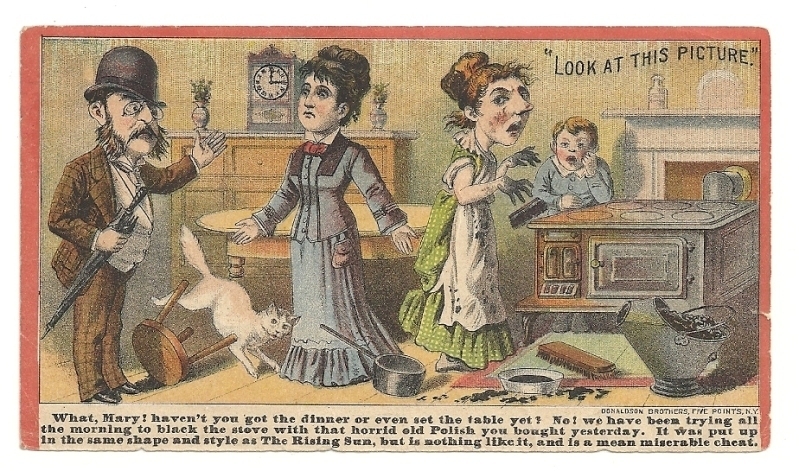 It certainly was convenient—have a little snort or a cup of joe and then head off to make tobacco products. 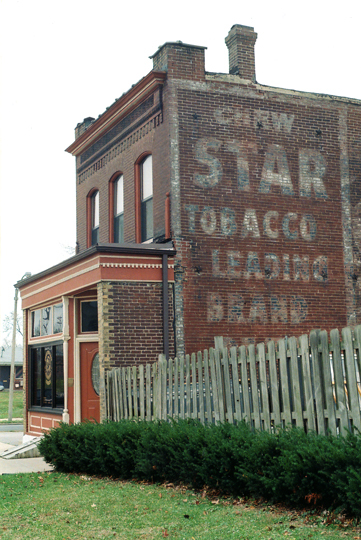 In fact, the name of the saloon is a nod to one of Liggett & Myers’ most popular products, Star Chewing Tobacco [not to be confused with Starr Chewing Tobacco]. 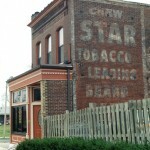 And just up the street, one block to the west from the old Star Saloon & Cafe is a large, west-facing wall sign exhorting passersby to “Chew Star Tobacco.” The slogan beneath reads “Leading Brand Of The _____ .” Alas, the missing word at the bottom is covered by sheet metal and other large objects which have been set against the base of the wall, for the wall bounds private property, someone’s backyard. 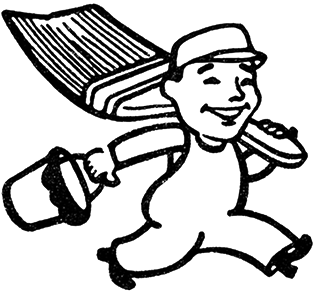 However, it is virtually assured the boast is “Leading Brand Of The World.” Original advertising bears this out. A vintage Star Tobacco pouch features not only this proud slogan but also the cocksure caption “Men who Chew are Men who DO.” With a skyscraper poking up through Gotham’s metropolis as a backdrop, it goes on to say, “Look at Woolworth’s, New York, the world’s tallest building. Each of its fifty-one stories was a ‘job’ that required clear thinking, accurate action. And the majority of the men engaged in the work were tobacco chewers. STAR is the great American tobacco—made just right to suit the American taste.” From 1913 to 1930, the Woolworth Building was ranked the world’s tallest building. 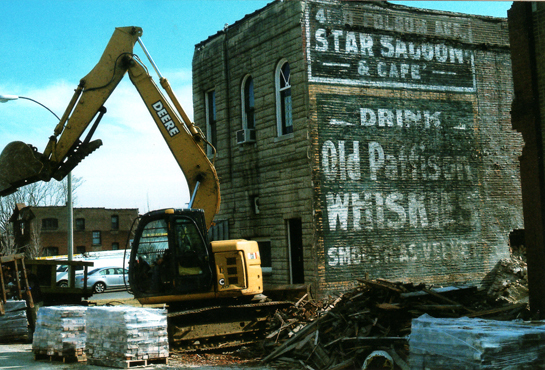 Finally, one day in February, 2012, Don Bonnell called to say the contractor and his crew were on site, removing the derelict building. At last, the wall sign would be revealed. Upon arrival, bricks, stacked squarely, had been palletized and lay in the street, ready to be loaded onto heavy-duty flatbed trucks. These bricks were about to depart for Louisiana, where they would form a new structure there or beyond, reincarnated for 21st century purposes. The sign company that did the job gave itself a modest plug. Along the bottom, barely discernible, one makes out the attribution: American Advertising & Bill Posting. Now that the wall is exposed elements will have their way with it. Graffiti artists—vandals—will see it as something to be enhanced—violated. Birds will crap on it and Old Sol will bake it onto the surface. Despite all this, motorists, pedestrians and neighbors will take notice. When did that show up? they may wonder. Who’s behind it? Indeed, the answer would likely surprise them. The sign you see is the result of a marketing plan hatched in the mahogany-paneled office of Robert P. Pattison, president of a long-defunct distillery that operated in late-19th century Scotland. 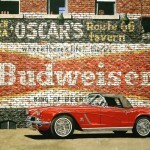 Dana has painted professionally since 1973, and taught advanced art at the high school level until 1987, when he began to paint on a full-time basis. 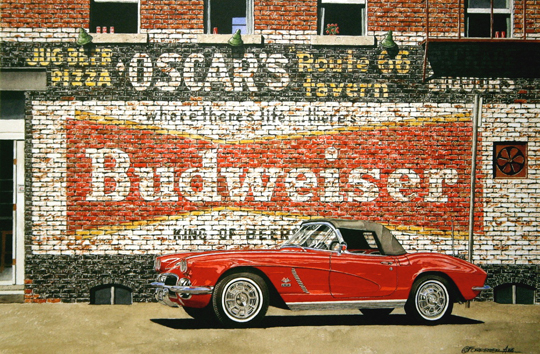 He has won many awards in regional and national exhibits and, in 1981, when he was elected as a member of the American Watercolor Society, he became one of the few painters to be a member of both the American and National Watercolor Societies. Dana Forrester lives in Independence, Missouri. 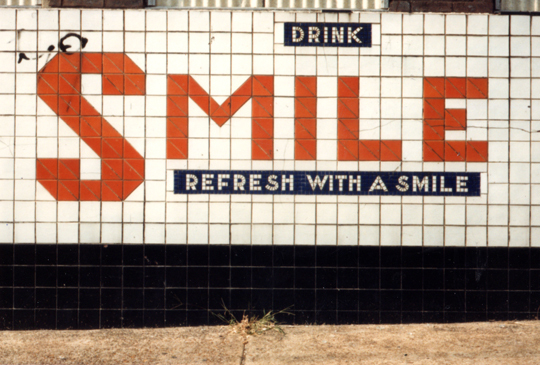 Many a lubricated patron of the taverns and restaurants that make up the Soulard neighborhood has at one time or another pondered this large and friendly sign, one of the best remaining examples in St. Louis. Dr. Hoffman’s Red Drops rests on the north face of a building on Ninth Street at Allen. There are four distinct lines of copy, the first two boldly speling out the brand name of this patent medicine. The third line is mostly readable, and the fourth line less so. It is the third line that intrigues, for Dr. Hoffman’s claims to cure or relieve “Colic, Cramps and Cholera Morbus.” Cholera? There hasn’t been a serious outbreak of cholera in St. Louis since 1866. The fourth and last line reads “World’s Greatest Diarrhea Cure.” Wow, this must have been some really good stuff! It is quite possible this sign has lasted more than 120 years. 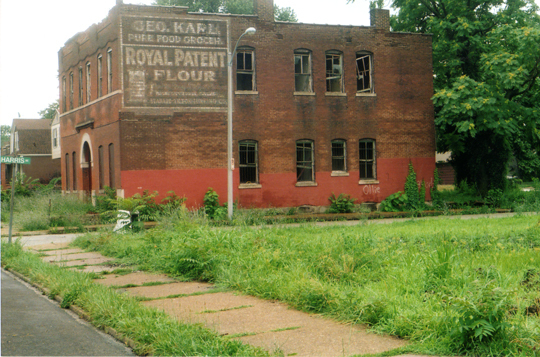 The Lemp Avenue Archaeological Sites, on their website, shows a Dr. Hoffman’s Red Drops medicine bottle, excavated from a privy not far from this building. The raised letters on the bottle, dating to the 1880s, say it was used for relieving menstrual cramps. 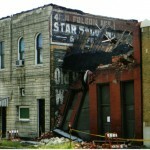 Additional evidence comes from the owner of the building adjacent to the old sign. 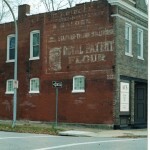 Oreon Sandler stated that his building dates to 1879, and since the architecture of the Dr. Hoffman’s building is similar, we may surmise the wall as well as the sign painted on it is of like vintage. 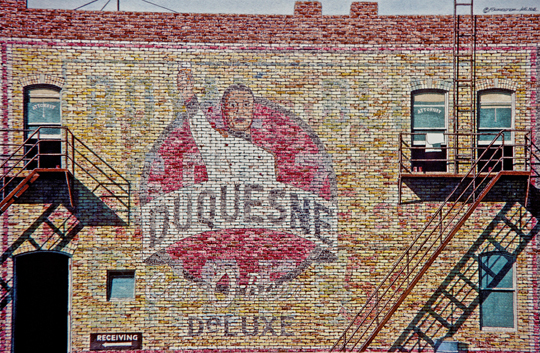 Walter Sheppe of Akron, Ohio submitted this photo, exposed in 1990, saying it is his favorite wall sign of all that he has seen. 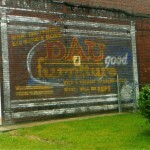 It is an ad for the Euclid Ave. Carriage Company, said to date from 1895. 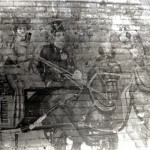 The picture in detail shows a folk-art rendition of a Victorian-era couple in their new carriage. 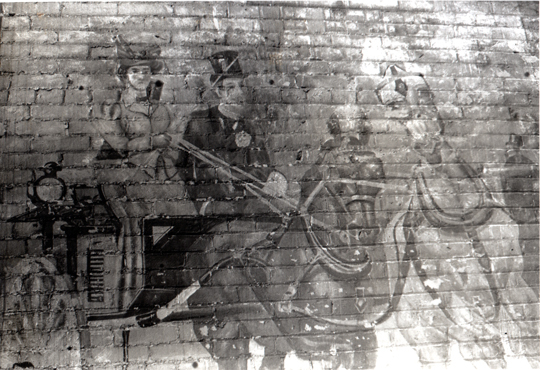 The carriage ad was painted over an older ad for milk. 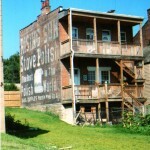 Walter Sheppe said that the sign was preserved by an adjacent building that had recently been demolished. 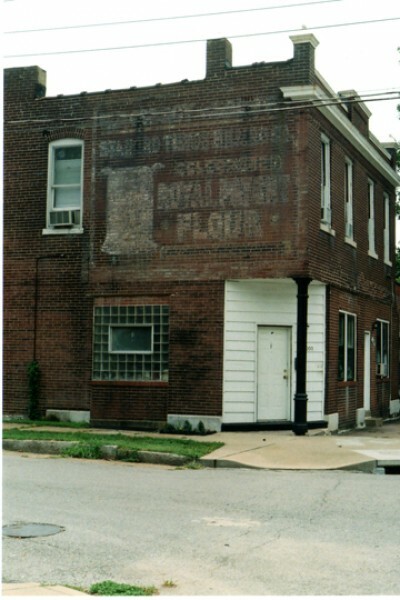 Orange Smile Syrup Company opened at 2001 S. 9th Street in the Soulard neighborhood in the late 192os. The Company produced Buster Cola, Cheer Up Soda, and Smile Orange Drink. The company survived for nearly 35 years as a soda manufacturer and also bottled those same drinks in this very building. 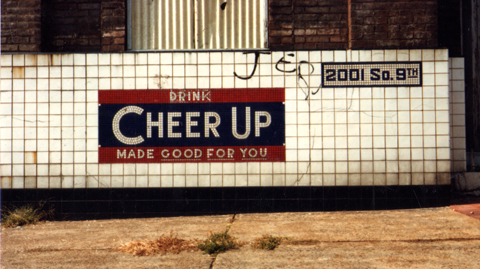 Shortly after opening, William F. Cox added color tile advertisements of “Drink Cheer Up, Made Good for You” and “Drink Smile, Refresh with a Smile” on two sides of the building. The old soda factory closed around 1963, the building is now a condominium, but the memory of Smile and Cheer Up are still with us. A recently discovered gem in remarkably good condition, Rising Sun was exposed by demolition of an adjacent building as late as 2009. 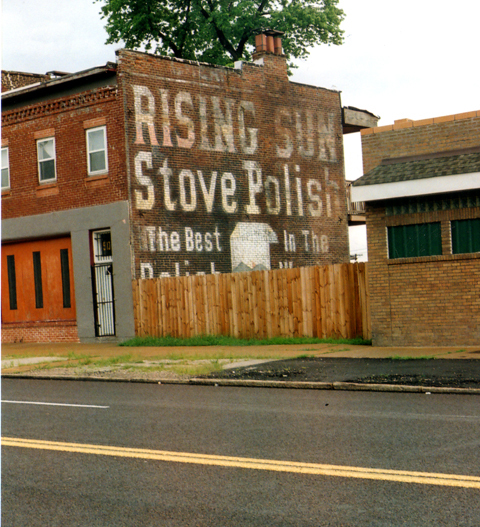 Amazingly, some of the original color is still apparent, as seen in the rosy hues of the letters in “Rising.” The building is in North St. Louis, on N. Broadway at E. Prairie, alongside of Interstate 70. 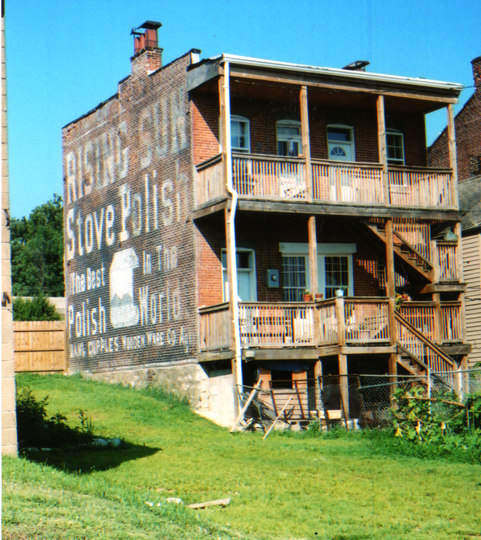 Although the wooden fence obscures the bottom half of the sign, the slogan reads “The Best Polish In The World.” Additional text near the bottom indicates the product is available through the Samuel Cupples Wooden Ware Company; a 19th Century St. Louis Merchant of note, Cupples had several enterprises, Wooden Ware being one of them. 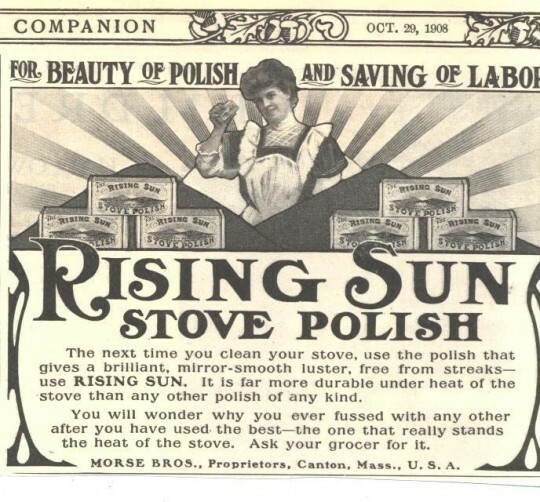 A plethora of Rising Sun Stove Polish artifacts and memorabilia — Victorian trading cards, posters, brass engravings — are available for purchase on the Internet. At the far south end of St. Charles’ historic main street, within a stones throw of the Missouri River sits a grand old building. 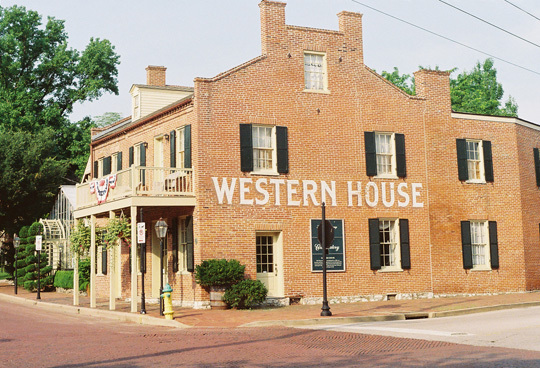 The Western House was built prior to 1821 as a hostelry and inn. Many pioneers in covered wagons left from this point following Boone’s Lick Trail out of which grew The Santa Fe Trail, The Salt Lake Trail and The Great Oregon Trail. In 2011, the building is home to The Conservatory, a venue for wedding receptions. Here are some of our picks for must-see TV. 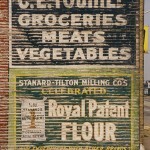 Fading Beauties: Painted signs can give us glimpses into the history and culture of our past. 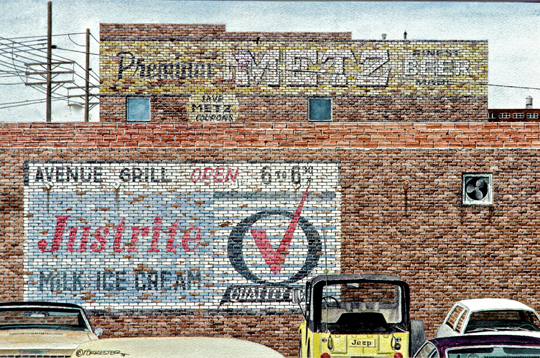 Haas, Cynthia Lea, and Jeff Holder, Ghost Signs of Arkansas, University of Arkansas Press, 1997. Jump, Frank, Fading Ads of New York City, The History Press, 2011.